The running back started his senior year at Notre Dame facing a suspension and an uncertain future. Then ‘mama’—who was once thought to be gone, and who might not be with him much longer—moved in to help guide his best year yet. SOUTH BEND, Ind. — Dexter Williams catches the ball on the last route of his pro day workout and runs down the field near the entrance of the Loftus Sports Center. He looks up into the balcony of bleachers above him and searches for her. Cheryl Williams is already standing at the railing, waiting for her son. She wears a Notre Dame winter beanie over her long hair and smiles down at Dexter, who is hard to miss with the back section of his hair dyed a bright Irish green. Dexter points up and she points back. Dexter’s pro day workout had gone well. The same could be said of his life in general since his roomate—mama—moved in. When he was younger, he thought he lost her. Now, as she has been for the past few months and plans to be as Dexter starts his NFL career, she’s here. Dexter was 14, a freshman at Orlando’s Olympia High School. He was already a budding star as a running back, brought up to varsity after just three games with the JV team, which rarely happens at high schools in the football-strong area. One typical morning he got ready to go to school, gave his mom a goodbye kiss on the cheek and said, Love you mama, I’ll see you later this evening. Cheryl, then a private school teacher for kindergarten through second grade, had the day off. While Dexter was in class, Cheryl suddenly began to feel exhausted. A couple years earlier, she’d been diagnosed with myasthenia gravis, a chronic autoimmune neuromuscular disease that causes muscle weakness—she assumed these were the usual symptoms. Myasthenia affects her skeletal muscles, as well as facial muscles, eyelids, vision, and even her voice. She speaks softly because she loses her voice easily. Her husband, Leonard, was also home that day, and suggested she lie down to rest, which typically improves myasthenia symptoms. Cheryl went to their bedroom and quickly fell asleep. When Dexter got home from school that afternoon, he went to find his mom—they would always catch up as soon as he got home and go over homework together. He found her asleep in her bed and tried waking up her up. Cheryl didn’t respond. Dexter knew something was wrong and ran to find his dad. Mom isn’t waking up! Leonard rushed into the bedroom and started shaking Cheryl. “It was like she just couldn’t come out of it,” Leonard says. Cheryl could crack her eyes open a sliver but her eyelids were too heavy. Her breathing had slowed drastically, and Leonard knew he needed to get her to the hospital immediately. She was experiencing a mysathenic crisis; her respiratory system was shutting down. When Cheryl arrived at Florida Hospital, doctors immediately hooked her up to a ventilator to restore her breathing. They had to put her in a coma. After three months of Cheryl living with the help of machines, Leonard sat Dexter down. “I remember the conversation with my dad like it was yesterday,” Dexter says. Father and son were in Leonard’s truck on their drive home from a hospital visit. Leonard sighed, Son, I’m thinking about about pulling the plug, because mama, she’s struggling and I don’t want to see her like this and I know you don’t want to see her like this. Leonard says doctors weren’t sure whether Cheryl would ever come out of the coma, but every day that went by made it less likely. Because of her previous diagnosis, Leonard and Cheryl had already talked about worst-case scenarios, and Cheryl had said she didn’t want to be kept alive by machines. Leonard and Cheryl were there for Dexter's pregame walk, one of the highlights of his breakout senior season. After three seasons as a seldom-used backup, Dexter’s senior year at Notre Dame started with a suspension for violating team rules. Knowing her son would be frustrated, upset with himself and in need of support, Cheryl offered a solution: Since Dexter didn’t have a roommate, she’d move in with him. Dexter agreed without hesitation, because of the time they had lost and because of the uncertain amount of time they have left. Along with myasthenia gravis, Cheryl, now 62, had recently been diagnosed with pulmonary arterial hypertension (high blood pressure in the lungs), a condition that brought a life expectancy of three to five years. “She made the house feel like a home again,” says Dexter. Dexter declined to specify why he was suspended, but it wasn’t his first issue with discipline at Notre Dame. In 2016, he was charged with misdemeanor possession of marijuana after he and a group of teammates were stopped for speeding and an officer discovered marijuana in the car. When Cheryl prays, she doesn’t pray for a cure for her illnesses, she prays for Dexter’s dream of playing in the NFL, a dream hatched when he first started playing football as a 9-year-old kid in Orlando. Dexter has to constantly remind her to rest, because she hasn’t slowed down. Cheryl made the most of her life on campus. She went to nearly every football game, two of Dexter’s Africana studies classes, and became a second mom to many of Dexter’s teammates, who would come over every weekend for chicken parmesan and, sometimes, advice. Cheryl is typically hospitalized every two months or so because her myasthenia symptoms escalate to the point where her respiratory system starts shutting down. To prevent this, she receives intravenous immunoglobulin treatments (immunoglobulin are antibodies found in blood plasma). While in South Bend living with Dexter, she missed her twice-a-month IVIG treatments, but her symptoms never got severe enough to require hospitalization. Even though he missed the first four games, Dexter thrived last season. His 995 rushing yards and 13 total TDs both surpassed his numbers from his first three seasons combined. 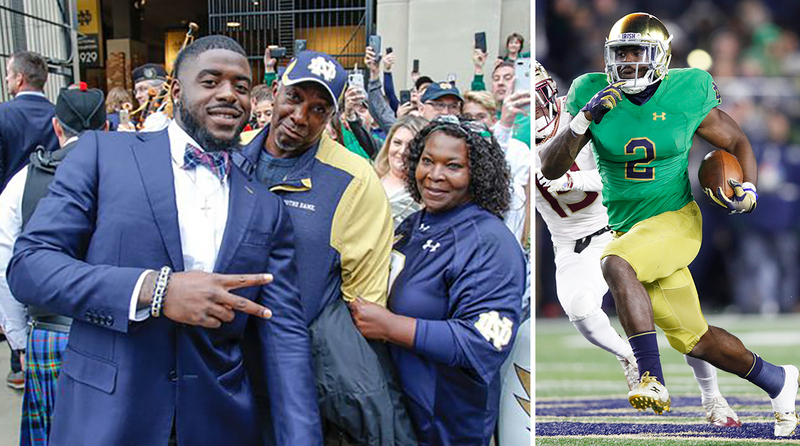 He was the centerpiece of an Irish offense that earned the program’s first ever College Football Playoff berth, and Williams earned an invitation to the Senior Bowl where he was named Practice Player of the Week for his position group. Mother and son both had their best seasons. After the college football season, Cheryl followed Dexter to Bradenton, Fla., where he trained for the NFL combine at IMG Academy. IMG assigns prospects to three-bedroom stuccoed villas in the palm-tree dotted neighborhood across the street from the IMG campus. Some prospects bring their gaming consoles, or smuggle in their dogs. Some have even brought their girlfriends along for the eight-week stay, but until the Williamses, no prospect at IMG had ever brought their mom. “I definitely didn’t see any other moms there,” Cheryl laughs. Even if the medical timeline for Cheryl holds true, Dexter is very close to making that ultimate NFL dream a reality for himself and his mom. Scouts believe his marijuana possession arrest and the suspension this past season will probably cause him to be selected a little later than his true value, but his name will be called. NFL teams admire Cheryl and Dexter’s relationship and their outlook on life. They also understand the steadying influence Cheryl has on Dexter. Cheryl is ready to pack her bags for whichever NFL city Dexter lands in. She’ll have to help him dye his hair—from the current Adore hair color shade 165 “Clover”—to his next team’s colors.